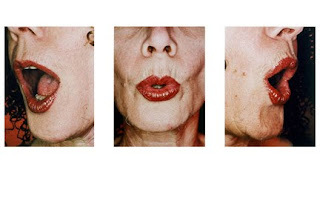 EVERY LINE & EVERY OTHER LINE calls into question the history or portraiture, but also makes evident the political implications of how the face, and the mouth in particular, acts as a contested site. Working in photographic installation, framed prints, and video installation, these artists exemplify a diverse approach to the medium, but also the subject matter: These portraits consider the face as a site of colonization, a document of control, and a space of power. Exhibited together, we can ask what the mouth produces in terms of truth, consequence, renewal, aging, beauty, lies. We hope to see you at the series of artists' talks programmed in conjunction with this exhibition, as well as at the opening reception: Friday 18 March at 7PM. PLATFORM acknowledges the support of its membership, Board of Directors, staff, and partners in presentation. Operating and project assistance for PLATFORM programming is provided by: Manitoba Arts Council, Winnipeg Arts Council, The Winnipeg Foundation, and The W.H. & S.E. Loewen Foundation. Partners in presentation include: Mentoring Artists for Women's Art, The School of Art at the University of Manitoba / Supported by the School of Art Visiting Artist Endowment Fund, Gallery 1C03 at the University of Winnipeg, and Fleet Galleries. The work in EVERY LINE & EVERY OTHER LINE appears courtesy of the artists and their respective representatives: Diaz Contemporary (Toronto), Leo Kamen Gallery (Toronto), Peres Projects (Los Angeles / Berlin), Paul Petro Contemporary Art (Toronto).